Do you know how ERP software is sold? It’s fairly straightforward. Every CEO has a similar problem… they want to know how much everything in their company costs, vs. how much value it brings to the company. ERP vendors meet with executives and show them pretty graphs. Then, of course, the company signs a contract with the ERP vendor for hundreds of thousands of dollars to install, configure, and support the system for one year. By the time the project is complete it costs twice what it was supposed to and all the end users are frustrated because it’s so tedious to use. How does this happen? Why did the CEO think they were buying into a low-risk off-the-shelf product? The CEO was lulled into a false sense of security by the pretty graphs. Any programmer can tell you that charts are a solved problem. If you give any programmer a database full of rich and meaningful data, they can whip up pretty reports, even very complicated ones, in a matter of days. The hard part is filling the database with accurate and complete information! If you buy an off-the-shelf ERP application, getting the data into their system is the hard part. You either need to write tons of custom code to copy the data from existing systems, or you need to change your business workflows to conform to this new software. It’s that first item, Availability, that’s really interesting. Basically it’s the ratio of actual equipment uptime vs. scheduled production time. Let’s say you’re buying an “automated OEE solution,” so it’s going to pull the status of the equipment (running or not running) from the PLC. It doesn’t really matter because that isn’t enough information to calculate your Availability. You need a production schedule to begin with. Who enters this data? Does it already exist? In what form? Excel? A proprietary ERP or MES system? What custom code has to be written to get this production schedule into a format that the “shrink-wrapped” OEE software can understand? Does the company have to convert to using the OEE software’s proprietary scheduling system? Do we have to enter the schedule twice? If you have to do all that work, why are you buying an OEE software package? If the production schedule is already in your ERP system, and you have in-house expertise to get the running status out of the equipment, why bother converting the schedule into some other format? The equations for OEE are grade 5 math. Any programmer can make pretty OEE graphs if they already have the data they need. What value does the OEE software actually bring? When you think about enterprise software, remember that most of the real value is in the accuracy and meaningfulness of the data in the database. Money should be invested in acquiring, storing, curating, and documenting that data. Once you’ve accomplished that, then you can add your whiz-bang charts. Don’t go putting the cart before the horse. There’s been a lot of discussion recently about the dangers of connecting automation equipment to networks, and yet there are significant pressures to do so. Of course, I don’t ever think that you should take a PLC and put it on an internet accessible IP address, but it’s certainly common practice to connect industrial automation equipment to internal LANs to facilitate data collection. People in the front office need to push production planning information down to the production floor, and they need real-time data on what’s going on (not to mention for historical data logging, historians, etc.). It’s all too common to throw a PLC on the same network as your front office, and I’ve seen it blow up. What happens is something invariably goes wrong on the office network (someone plugs two ports together on the switch in the boardroom, or someone brings in an infected music player and plugs it in, or the DNS server at head-office goes down and the local DNS doesn’t work correctly… I’ve seen a lot). However, you want your machines to keep going when this happens. This is all made worse now that (a) industrial automation equipment is more commonly based on off-the-shelf commodity hardware and software (e.g. windows PCs) and (b) the people writing malware can actually spell PLC now. Up to this point there’s been some form of security through obscurity. If you have a local IT staff that’s on the ball, you really should be getting them to handle the network layout. On the other hand, if you’re in a small facility with limited resources, there’s a lot you can do by making some simple design choices that will go a long way towards improving the reliability and security of your systems. The automation devices typically have fixed IP addresses (I personally prefer this because it means these devices aren’t dependent upon an external DNS or DHCP server – two less dependencies are good). Chances are that these IP addresses won’t work on your plant network, so you have to manage those IPs at the plant level. You’re opening yourself up to someone with the wrong IP on their laptop pouncing on your PLC’s IP address, and then bam, your machine is down. Now if you’re just a little manufacturer with two machines out back and your data-collection link isn’t critical, you can probably get away with one of those home routers from Best Buy that you’d use to connect your laptop and your desktop at home to your cable modem. Note that it doesn’t need to be wireless, and you’re probably better off if it isn’t. The way you hook it up is to connect the Internet (Uplink) port on the router to the plant network and run a cable from one of the ports on the LAN side to the existing Ethernet switch in the machine. If your data needs to be a bit more reliable, consider buying some kind of Cisco router with NAT capability (but you’ll be going from the $50 range to many hundreds of dollars – your choice). Now, when you configure it, you want to make sure that you turn off the port forwarding function, the DMZ function, disallow remote administration, and block all anonymous internet traffic (these should be default settings, but it’s good to check). Also, make sure the router’s local IP address doesn’t conflict with the PLC’s and HMI’s, and make sure they have the same subnet. Typically you’ll want to either turn off DHCP on the local side, or limit it to a range that won’t conflict with the fixed IPs. DHCP is handy when you connect your laptop to the programming port. Now what you’ve done is made it somewhat invisible from the plant side. Some piece of malware scanning for devices on your plant network should just see a black hole. Now on the PLC side, you can now initiate a connection to the data collection server even though the data collection server can’t connect to the PLC (in the same way that your home computer can connect to Google, but Google can’t get to your PC – theoretically). Note that a piece of malware on your data collection server or on one of the routers/switches in your plant network could intercept this communication, and own your PLC, but at least you’ve significantly reduced the surface area of attack. Not perfect, but reasonable at this time, depending on the sensitivity of your equipment. I’m assuming you’re not enriching uranium or providing drinking water to my community. So how do you get the data from the PLC to the data collection server? In the old days you’d have some software on the server like RSSQL, and it used a product like RSLinx Enterprise and as far as I know, it initiated the connection to the PLC. That won’t work in this case. Sometimes you’d throw an OPC server in there, and have some kind of historian that would log tags to a database. That OPC server, obviously, needs to be able to initiate a connection to the PLC. To use a router with NAT, you’d need to port-forward from the router to the PLC (or to the OPC server if it was inside the machine network). That’s undoing a lot of our protection. 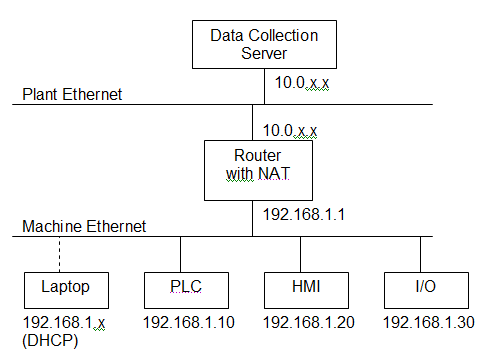 What you need to do is initiate the connection from the PLC, and have the Data Collection computer act as a Server. One way to do this is with a 3rd party Ethernet card, like this MVI56-GEC card from Prosoft for the ControlLogix line. I have used that in the past to connect to a server, but it involves a lot of ugly PLC coding. It’s your only option if you have to conform to someone else’s protocol though. If you just want to write data directly into a SQL database, there are 3rd party products that will let you do this (basically a SQL Server connector card). But there is an option without buying any new hardware. The ControlLogix/CompactLogix lines can send Unsolicited CIP messages, and you can find products that can receive these messages in the PC world, like CimQuest’s NET.LOGIX product. It can act as a server and receive data directly from the PLC – either individual tags, or even arrays of UDTs. The code on both ends is relatively simple, so all you have to pay for is the NET.LOGIX runtime license, which is cheaper than the hardware alternatives. Note that you can also do this with PLC5 and SLC500 devices, though there’s some more effort involved. I hope that’s enlightening. This is by no means a perfect solution, but it’s reasonable for now. It doesn’t plug the laptop hole (the programming laptop is probably still your #1 vector for malware to get into your machine network). It’s susceptible to man-in-the-middle attacks between the router and the data collection server. It’s susceptible to exploitable bugs in the router’s firmware. Beware and use your own judgement.